Five years. It has been five years since Hurricane Katrina hit the Gulf Coast. 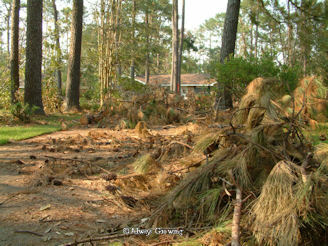 You have seen the pictures of the devastation the occurred in New Orleans and on the Mississippi Gulf Coast. 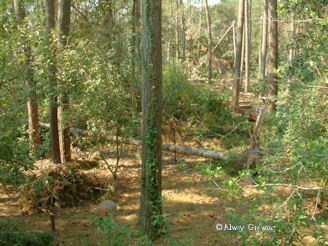 I thought I would show you some pictures of what Katrina did to our property. We are located about thirty miles north of New Orleans and were not affected by water. 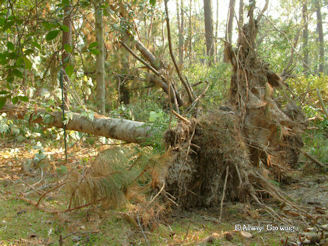 It was the wind damage that knocked down trees and left debris all over. It took weeks to clear our yard. 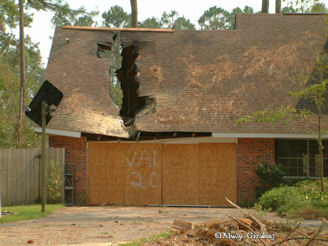 This is what we saw when we returned a week after Katrina hit with winds near 100 mph. This is what our street looked like by the end of September. Everyone piled the debris along the street for pickup. 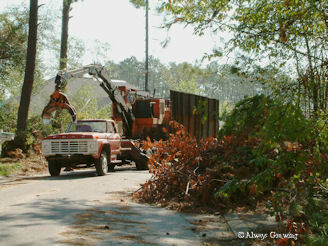 Finally, at the end of September the first trucks started showing up to pick up the debris. 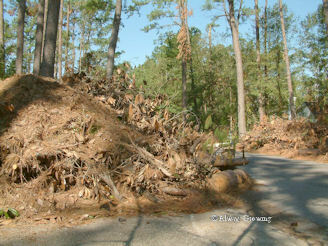 It wasn’t until the end of October that all the yard debris from Katrina was picked up. We were so glad to see it go. 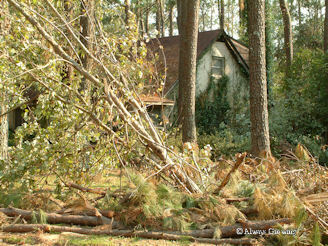 We were so fortunate that we did not have any damage to our home. 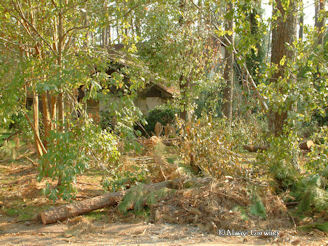 After seeing the damage that the 125 to 150 foot pine trees did to some of our neighbors, we couldn’t complain about being without electricity for three weeks, telephone for five weeks, cable TV for six weeks, and the internet for almost eight weeks. This house was just two doors from us. 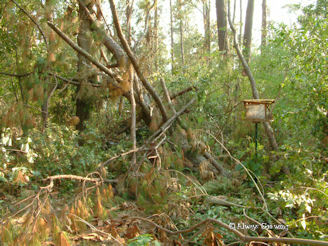 It took six big pine trees right down the middle. 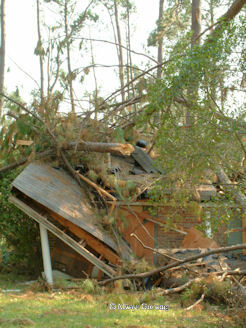 Another neighbor’s house where a tree hit. It has been almost five years since I have looked at these pictures, and they bring up so many emotions. While our neighborhood has been restored, so many of our neighbors had to move away because of transfers to other cities or elderly people who moved to be closer to family or destroyed homes forced others to move to other areas. I hope we never have to go through something like this again. I hope no one ever has to go through this. As I have moved away from growing flowering annuals to growing more flowering perennials, I have noticed that while there is still color in the garden right now, mainly from foliage, this summer I have missed the profusion of flowers that have been present in previous summers. I have not missed the high maintenance of annuals, however. Not having to be outside in the heat of summer watering, fertilizing, and dead heading annuals has been very liberating. I know as my perennials get bigger and more established there will be more flowers. Plants that are carrying me through this lack of flowers are the rebloomers, and one rebloomer showing off flowers right now is the gardenia bushes. 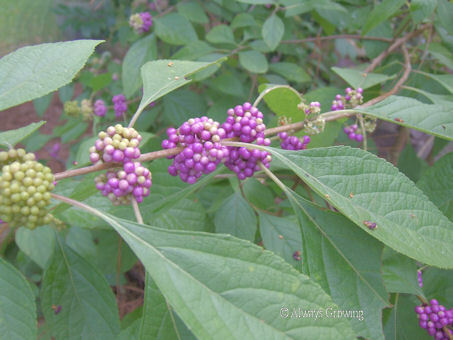 These shrubs will rebloom if they are trimmed back lightly in the spring as soon as they are finished blooming. The second bloom period is not as prolific, but having flowers in late August when most of the garden is tired from the long, hot days is certainly a treat. 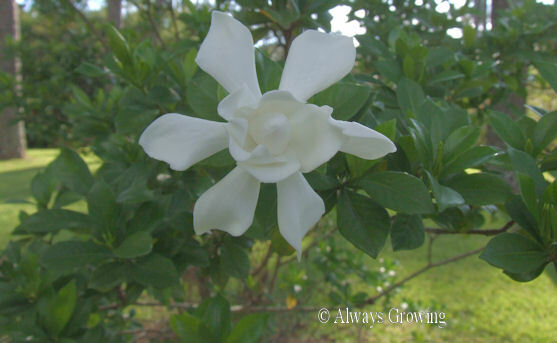 I am just hoping that next year there will be other perennials joining the gardenias in a late summer blooming. 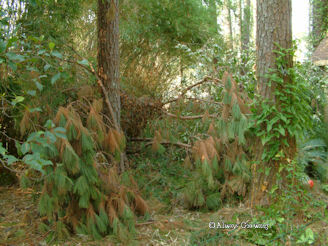 Conventional wisdom says that after a freeze, if a plant has not returned by mid-spring, it should be considered dead. This has always been my experience, until this year. I have written before about plants not showing up until July which is so unusual for the Gulf South. But this weekend, I just couldn’t believe my eyes. This is my coral bean tree (Erythrina herbacea). This is a deciduous tree, and because mine was only two years old, it has died down to the ground the past two winters, but coming back this late is just beyond my experience. It was heavily mulched, more so than in years past, and I was so surprised when it did not return by mid-May. In early July, I tried to pull it up out of the ground, and it didn’t budge. I just left it at the time (luckily) and figured it would just eventually rot away. I am a little concerned with its coming back so late in the summer. Will it be able to survive this winter? I am thinking about digging it up completely, putting it in a container, overwintering it in a warm place, and then planting it out next spring. When I first saw the blooms on this tree, I was so taken with the unusual shape and color that I just had to have one. This tree was growing outside of a stadium, and I even had thoughts of returning later to see if I could find some seeds to grow. Just by chance, about three weeks later, I found one to buy. Check out this post from Zanthan Gardens which shows the flowers, and you will understand why I wanted one so badly. Mine has not grown big enough to bloom yet, so I have no photos of my own. It would be a shame to lose this plant after it has tried so hard to return. I know now, I will not be so quick to give up on a plant that appears to be dead after winter’s chilly temperatures. In this case, never say never is so true. My memory is going. Case in point. A few years back, I either rooted or had a seed for a garden plant that I placed in a small four inch pot. I placed it in a small portable green house where it slowly grew. About two years ago, after I had forgotten what it was that I was trying to start a new plant of, I planted it in the garden. At first I thought it was Jewels of Opar, a plant from a favorite great aunt that I received via my mother. I swear the leaves looked just like that plant, but last year, the plant grew too big to be a Jewels of Opar. Then this year came about, and I thought the leaves looked a little like a hydrangea. Could this be a peegee hydrangea cutting I got some where? At this point I was berating myself for not labeling the cutting/seed. (I used to remember every little detail about gardening a few years ago.) It was driving me crazy trying to figure out what this plant was. I didn’t know if I should rip it out (maybe it was a weed that just grew in that pot) or keep it to see if anyone knew what it was. Well, last weekend, I noticed flower buds. Aha! I was sure I would finally find out what this plant was. Then came the rains which prevented me from checking on the flower buds when I came home from work last week. Well, finally, yesterday I was able to get out in the garden and was shocked when I saw a flower opened. Yes, it was a Blue Butterfly bush (Clerodendrun ugandense). I was so excited since my original plant did not return this spring. In fact, when I had a chance to replace my dead one earlier in the spring, I passed on it because I surmised that this was not hardy enough for our climate. In the past, it has died to the ground and was rather slow to return. I felt it was just not worth it. This plant is root hardy to zone 8, but this little one never died completely back. It must be in a better location for survival than my other one. 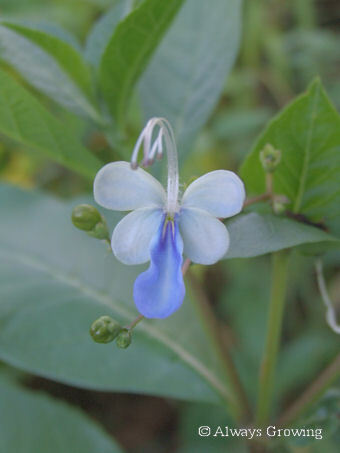 I love this plant for its lovely blue color but also for its flower shape. Those little blue butterflies all over the plant are so striking and, frankly, adorable. I lost a few plants to last winters unusual cold weather, but I am so fortunate to still have my blue butterfly bush. Lesson learned – Label plant cuttings! In springtime, we all eagerly check our gardens for returning plants. Living in an area where winter can often be very mild, it is not unusual for annuals or tender perennials to survive for another year. Impatiens, pentas, blue daze, and others will frequently only be nipped back, or they will return from the roots. This last winter, was particularly cold, so very few of these tender plants did survive, and those that did took a very long time to come back. Some didn’t show any growth until June or early July. 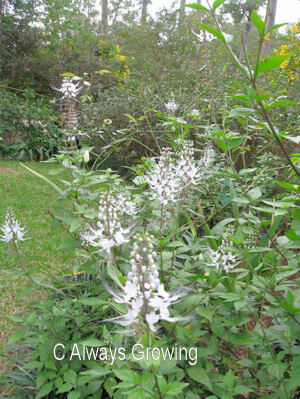 One plant that I though I had lost was Cat’s Whiskers (Ocimum aristatum). I had planted it for the first time last summer and loved how it looked and performed in the garden. Here’s how it looked last August. I did take some cuttings and was able to overwinter them which was a good thing since I was unable to find the white variety to plant this spring. However, I did not plant them in the same area. It was around mid-May when I saw that the old plants were sprouting leaves. It did take them a while to comeback, but finally, they have started blooming. I really didn’t expect these to return at all since it is listed as a tropical or tender perennial, and we had such a hard winter. It was in a bed that I heavily mulched so that may have been what saved it. Anyhow, from now on I will be sure and take cuttings every year since I never want my garden to be without these lovely and unusual flowers. Rain has kept me out of the garden for many days lately. I sure miss being able to stroll around and see what the plants are up to. Family issues have also preoccupied me, and I haven’t been blogging like I want to, but I am trying to get back in the routine of gardening and reporting on what is going on in my garden. The cannas have really been doing well with all this heat and rain we have been having lately. Tropical Sunrise is doing particularly well, sending up many new shoots. 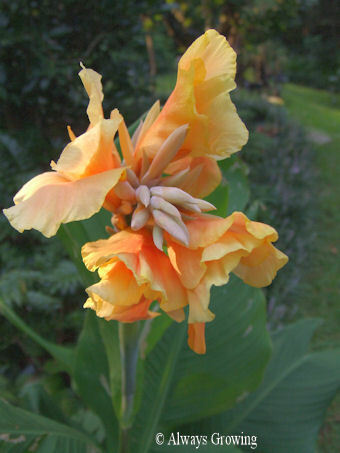 It is nice that this lovely orange canna is spreading. I can use the extra plants. This canna is planted next to blue plumbago, and the combination is a lot more attractive than I would have first thought. 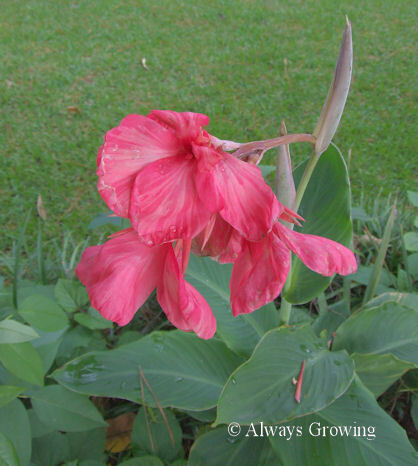 China Doll, a lovely pink canna that I have had for several years is also blooming well. I always look forward to its blooming. 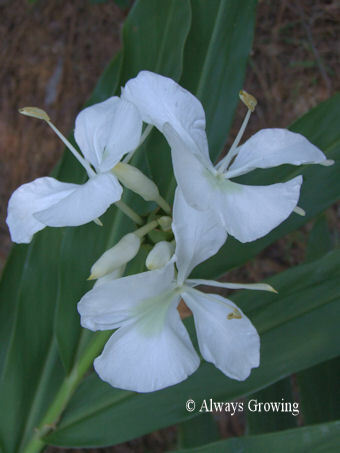 I think this was the first canna that I ever planted. Even though we are getting into late summer and fall color is just starting to show that it will be here soon, there are still enough bloomers like the canna to give a summer, tropical feel to the area. Rain, rain, rain. The last five days have been miserable – cloudy, rainy, humid, and hot. The tropical depression that thankfully did not develop into a storm certainly has given us enough rain for a while. The garden needed the rain and the cooler temperatures it brought, but for me there has been no getting out to check on things. Better weather will be coming though. Plants that do seem to be enjoying the clouds and moisture are the caladiums. These tubers were very tiny when I planted them. They were given to me by a neighbor who kept only her large ones and didn’t want to be bothered with the tiny new ones. After clearing out a section of the patio garden, I needed something to fill in the area, and these small caladium tubers were perfect. I am happy that the foliage has stayed short considering where I planted them, but I am surprised at how full the plants have become considering the small size of the tubers. I guess they must like where they are planted. Anyway, they certainly have filled in an area at the edge of the patio with colorful foliage for the summer. I usually do not lift my caladium tubers in the fall because they usually come back, but after losing some last year with our unusually cold and wet winter, I am thinking I will dig them up this year. 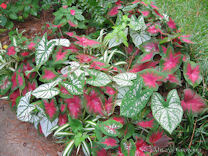 This is the first year I have planted mixed colors of caladiums in the back garden, and I like the effect. More and more, I am finding that colorful foliage plants are the way to go when you live in an area with long, hot summers. Today was my first day back at work after vacation. It wasn’t tough to getting up this morning, but I don’t know about tomorrow morning. The alarm goes off at 5:00 AM. Anyway, when I arrived home, I immediately set out the sprinkler in the back garden since we didn’t get any rain, and it is so hot and dry. While outside, I noticed how well my new elephant ears are doing. This plant was a gift from my number one sister, who has generously shared so many of her plants with me. This one is called “Coffee Cups” because of its cup-shaped leaves. With the black stems, dark green leaves and unusual leaves, this is a very nice addition to my garden. The Latin name is Colocasia esculenta ‘Coffee Cups’. 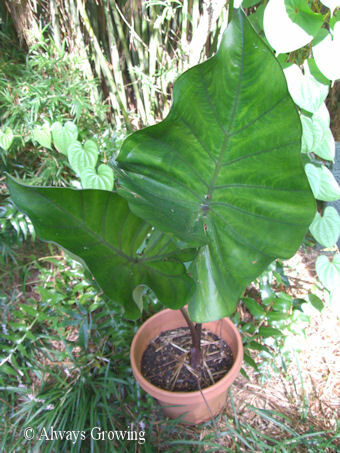 There is also a “Tea Cup” elephant ear that has the same shape leaves only smaller. Another elephant ear from this same generous sister is “Mickey Mouse”. She gave this one to me last year, and it took so long to come back after dying back during the winter that I thought it was totally gone. My sister gave me two more in mid-June, and I put one in a pot to overwinter and one in the ground. Just as I went to plant this second gift a few weeks ago, I saw a small leaf had appeared. My original plant was coming back. 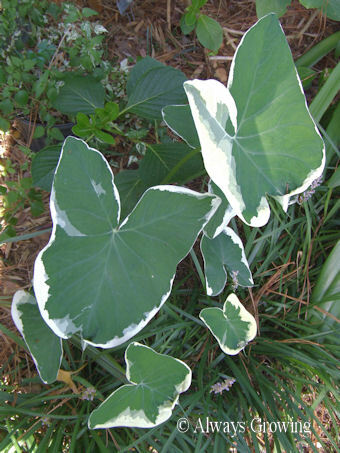 This was the latest I have ever had any elephant ears appear after a cold winter. Usually they are back up by April. Last year, I wrote about it here. Glad that the dry, hot weather hasn’t affected these “ears”. White. White is my favorite color for flowers, and two of the best white flowers have started showing up. The first is the butterfly ginger with its wonderful aroma. When these luscious flowers start blooming in late summer, their sweet, but not cloying scent, perfume permeates the garden especially at night and very early in the morning. I have this plant in three different areas of the garden. One area is in shade (these are the ones that have just started blooming) and two other areas that get morning sun and dappled shade. 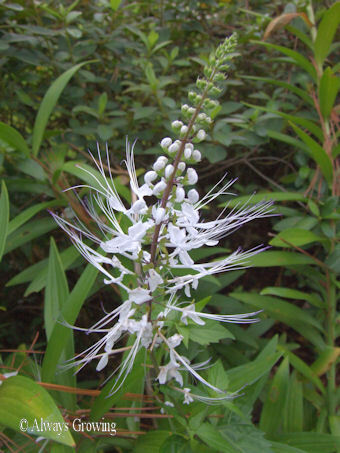 Because they bloom at slightly different times, there is that wonderful perfume and white flowers for about six weeks or more showing up in the garden. 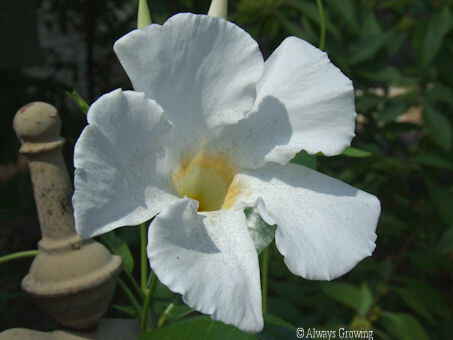 The other white flower that is now showing up is the white mandevilla. This plant was given to me by my mother three years ago, and every winter I dig it up and protect it from the freezing temperatures. This year it was very late in putting out flowers, and I wonder if it is because of the last winter’s extra cold. The only reason I think that winter is the cause is because I am still finding plants in the garden that are only appearing now. 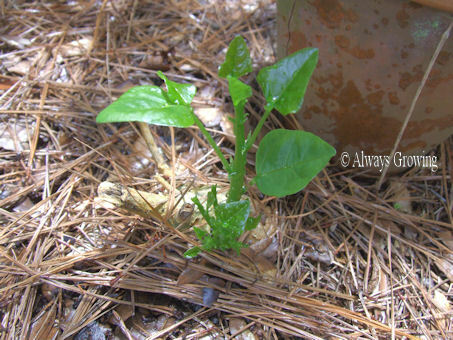 Usually, if a plant has not appeared by May, it is not coming back, but this year I am still finding sweet potato vines, palm grass, and elephant ears that are only showing up now, in early August. Anyway, I am certainly happy to see these white beauties now. Somehow, their appearance helps us endure the dog days of summer.